A collection of studies and compositions written to provide a creative approach to a common problem. Most guitar students have not worked through a methodical approach to reading music notation, which limits their personal progress and sometimes their career development. 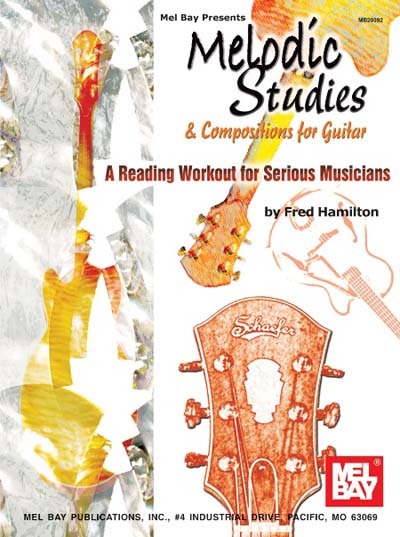 The author has approached the studies from two directions: horizontal, or up the fingerboard on individual strings, and positional. The first two parts of the book are extensively fingered and designed to make intervals and melodic patterns more visually apparent by repetition of similar ideas in different locations on the neck. The third part contains five extended compositions, which draw from the author’s jazz background. The first four include chord changes for duo practice, as well as challenging melodic lines in a variety of meters that may be used for the study of improvisation. The fifth piece is written in the Indian Raga style. Basic music theory and rhythmic studies are included in the appendices.